Thanks for your recent information regarding lawn fungus- we’re getting the PH tested before starting treatment to get the centipede lawn healthy first and then applying a fungicide. I’ve also been advised that we have a local area on our lawn that has lawn pearls. I’ve seen them attached to the grass roots and I’m prepared to dig out the infected area and put in new sod but we need your advice as how to effectively chemically prepare the sandy soil area to prevent any possible pearl larvae, insects or pearl sacs that might still be in the soil from coming back and infesting the area again after installing the sod. We appreciate any suggestions or recommendations that you might have, and thanks again for your help. First, you’re welcome and we hope our advice is leading you in the direction you want to go regarding your landscape and pest control concerns. Second, there is no need to remove or replace any of your grass if the main reason you want to do this is due to the ground pearls. In fact ground pearls are an insect; they fall into the “scale” family and are vulnerable to range of insecticides. In the article you’ll see us reference a PH METER and if you don’t have one, it would be well worth investing in one so you can check your PH throughout the year. Of all the things in your yard, the PH is the one variable that controls everything else. In other words, once it drops below 6.0, your turf will become weak and vulnerable to fungus, insects, weeds, etc. So if you want a healthy yard, you need to make sure the ph is kept balance. Now once the PH is fixed, apply BIFEN GRANULES at the rate of 2 lbs for every 1000 sq/ft and retreat once a month for 3 months. Bifen will control a wide range of insects using turf grass for nests including scale related pests. Next, spray over the granules with BIFEN XTS. This needs to be done once a month too while you see activity. Use 1 oz per 5,000 sq/ft. This formulation is fast acting and will quickly knock the down the active scale but it won’t penetrate down deep like the granules so you’ll need to do both for long term control. A good HOSE END SPRAYER will be needed to spray the Bifen XTS. This one is easy to use; add 1 oz of Bifen and fill it up to the 5 gallon line. Next, hook it to your garden hose and spray the entire contents over 5,000 sq/ft. If you’re PH is in the proper range, you should see improvement after 2-3 weeks. And after the second application, most problems will be resolved. After that, treat every 3 months with both granules and the liquid to insure they don’t come back. And be sure to check your PH at least once every 6 months. On a related note, the products above are not labeled for use in vegetable gardens. Essentially they’re a bit too strong. But we have two options that are safe enough for use in vegetable gardens and yet strong enough to kill active ground pearls. Like the approach above, you’ll want to first treat with a granule and but for vegetable gardens, you’ll need BIFEN GRANULES FOR GARDENS. Its about half as strong but still effective. Use 1 lb per 500 sq/ft. Once the granules are in place, spray over the top with CYONARA RTS. Safe enough for use on vegetables and fruit bearing plants, Cyonara will work on a range of scale including ground pearl. Just hook it to your garden hose and spray. One jug will cover up to 16,000 sq/ft so it goes a long way too. Treat every two weeks for two months to knock out the current problem. As to Ground Pearls, according to the above as easy to control….my yard and my neighbors’ yard (across the highway) are infested to the point that hardly anything will grow–not even a healthy weed. This all has happened to my yard within 3 years..my neighbors in 10 years. I have centipede, neighbor is trying Bermuda. Mine is not as bad as his but “pearls” appear in spots all over the year where dying is occurring in circles. I have dug and found “pinkish pearls” and whitest eggs clusters. HELP! As explained above, the first thing you need to do is check the ph of your soil to make sure it’s around 7.0. 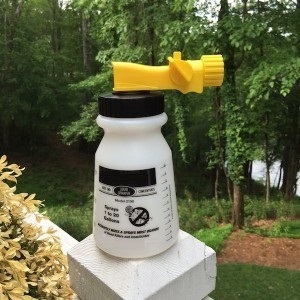 Get a PH Meter to do the job; they are well worth the investment since they can be used over and over and if your yard is susceptible to any kind of PH change, these meters will be something you’ll need for years to come. Now once you get a good measure of the soil PH (and/or your neighbors), email us the results and we should be able to further advise. Neighbors yard is a pH of 6.5…has or is trying to establish Bermuda. I have just placed an order for a pH meter. 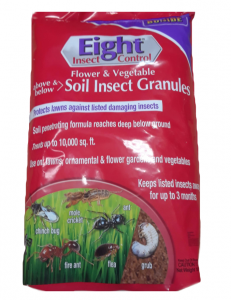 Once the PH is known to be 6.5, you can get control of this pest by using a combination of Bifen Granules and Cyonara RTS. 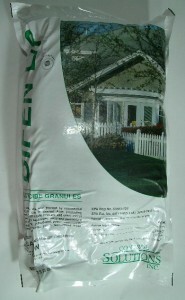 Apply the Granules monthly at a rate of 25 lbs per 1/2 acre. They will slowly work their way into the soil and plants taking away key resources needed for the ground pearls existence. And twice a month apply Cyonara RTS at a rate of 1 quart per 10,000 sq/ft. This will work on the exposed stages providing fast control but not totally effective unless its used with the granules. Follow this treatment schedule and you will start to see improvement after 1-2 months of treating; after 3-6 months the problem will mostly resolved. Thanks for the feedback…..will try this approach. Yes. In fact if you’re treating 1/2 acre or more, the concentrate is definitely the way to go because it will save money. So for ground pearls, you’ll need to apply 5 oz per acre. This works out to 1 oz per 8,000 sq/ft. And a good sprayer for the concentrate is our 6 Gallon Hose End Sprayer. Here’s how you’ll use it. 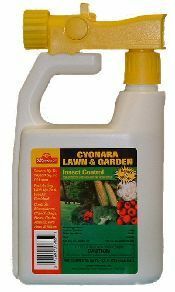 Put 1 oz of the Cyonara Concentrate in the 6 Gallon Hose End. Fill it wither water, hook it to your hose and spray the entire amount over 8,000 sq/ft.